If you are building a custom home, you have the freedom to implement the design features that suit your aesthetic and optimize the natural characteristics of the site in order to develop a structure that meets your needs while respecting the environment at the same time. A structure that is simpler will have fewer opportunities for failure than one that is more complex. In the context of a green home, failure primarily means air and/or water leaks. The more transitions a home has, such as corners and connections between the walls and roof, the more likely it is that unwanted water and air will be able to enter your home. Air leakage is a concern when building green homes because when warm air escapes to the colder outside air, mechanical systems have to work harder to maintain the desired temperature. The same is true when warm air comes into the house in summer and cooling systems have to run more frequently. This leads to more energy consumption, higher utility bills, and a bigger environmental footprint. To reduce the chance for air leakage, the exterior of a green home should have no more than three to four roof planes and six to eight corners. To put it in visual terms, a cube or rectangle has four corners, an L-shaped building has six, and a U-shaped building has eight. Additional features like dormers and bay windows add more corners and roof planes, adding complexity and increasing the chance that warm air will leak out of your home. It’s worth noting that simpler structures also cost less to build because fewer materials are required. So, you not only get the bene ts of long- term savings from less energy consumption, but you also save on construction costs. Site, Undisturbed: How to lessen your impact on a building site. The greenest solution is to build on an area that has already been developed so that you don’t have to remove any additional plant life. However, this isn’t always possible. If your property has a lot of trees, think about ways you can position the house so that you have to cut down as few as possible. Can you use that wood in the construction of the home or for some other beneficial purpose? Think about all of the possible options for the placement of your new home and choose the one that requires the least amount of tree removal and blasting, while still allowing you to optimize the orientation and shading. Another factor to consider with respect to site disturbance is the amount of impervious surface you will create. Features like driveways and walkways are practically necessary, but you have the option to limit the space you will cover. You can also choose materials that allow water to penetrate into the ground, limiting runoff from your property. Your home’s distance from the road will also impact site disturbance, especially if you will require a long driveway or significant digging to install utilities and other services. Making the Grade: A couple quick considerations around site drainage & durability. In most cases you can overcome any drainage challenges the site presents with some combination of grading, sophisticated drainage techniques, and internal pumps. However, some of these solutions also come with a higher price tag for site work and require additional site disturbance. Most homes do not sit on top of a barren hill without any surrounding landscape features. In reality, most sites are surrounded by buildings, mountains, trees, or other features that create shade. Where your home is positioned on the site and how it is oriented will impact how much sun reaches the house at different times throughout the year. If you are trying to maximize solar gain in winter, you will want minimal shade on the south side so as much sunlight as possible can enter the space. This means avoiding situating the home where buildings or evergreen trees will block the light on the south side of the home. If you do want to take advantage of shade in summer, try to position the home so that mature, deciduous trees are on the south side to block the intense summer sun. When it comes time for their leaves to fall in the cooler months, they will not block sunlight when needed. You can also build strategically sized roof overhangs to minimize solar heat gain in summer as the angle of the sun is much higher during these hotter months. A designer can determine the ideal length of your overhangs — or trellises — to block out just enough unwanted summer sun. 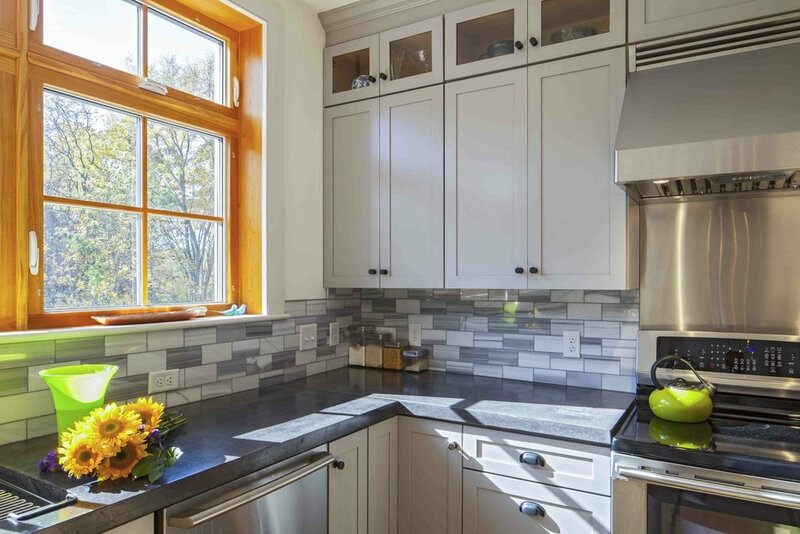 Additionally, if too many windows are placed on the western face of the home, overheating in summer months will most certainly occur, even in New England, since the sun will be too low at that point to be blocked by a reasonably sized overhang. If you plan to install rooftop solar panels, you also want to be sure that a sufficient roof area is not shaded so it can receive adequate sunlight all year long. prospects are unsteady, and the future is impossible to predict. Between the real or imagined threats of climate change, nuclear war, and zombies, it’s sometimes difficult to see past the parade of horrifying news stories, devastating storms, and overzealous Second Coming preachers that batter us with their end-of- days prophecies. We don’t have to agree on how or when the world will end, but let’s be honest – we’re all wondering how we’ll get through it. If you are hoping to build a new home, but are concerned that there may be no point in trying to survive the coming horrors, I have good news. BrightBuilt Home understands these concerns, and will work to create a home for you that can keep you and your family safe through (almost) any apocalypse. BrightBuilt Home was started as a way of mitigating the environmental destruction that is wrought everyday by the building industry. The intention is that every home is capable of supplying its own power, and as such, the homes are well insulated, air sealed, and equipped with energy efficient systems designed to smooth out the whims of the weather and harness the ever more sinister power of the sun to ride out progressively more erratic winters. It’s like environmental Tai-Chi, with triple pane windows. While you can’t predict typhoons in November, you can be sure that you will be cool in the summer and warm in the winter, and that the storms raging outside your window will seem quaint from inside your cozy BrightBuilt Home. Passive solar design will ensure that you collect as much heat as possible from the winter sun, while the summer sun is blocked from cooking you on your living room couch. Deep insulated walls have the dual effect of holding the temperature steady, and silencing the crack of thunder outdoors. Grow happy houseplants on your generous windowsills to distract from the tendrils of man-made desert drifting across your yard, and water them with our standard low-flow water fixtures. capital gain by any definition, right? generation is expected to move out of the basement. battery supply and break up with the grid when Wall Street gets too hairy. corpses of former neighbors with less foresight. isolationist lifestyle you’ve been dreaming of. Recommended Modification: Upgrade to a medical grade filtration system. If there’s anyone you want to take with you (provided they haven’t been infected yet) spring for the two bedroom model. that the world has not become a horror movie hell landscape. have a great vantage point for target practice. zombies rather than the clumsy and slow Walking Dead variety. those first few critical days. you cozy until the heat pumps come back on. Remember, when discussing your construction budget with your BrightBuilt Project Manager, that garages, cinder block walls with broken glass toppers, razor wire fences, pointy stick barriers, decks, and porches are not included in the base pricing, and will require additional estimating by your builder. With a BrightBuilt Home as your base of operations, your chances of outlasting whatever is coming are greatly increased, and nothing beats the peace of mind of knowing that you will probably survive an imaginary future catastrophe. Give us a call to get started, and whisper “the sky is falling” repeatedly into the receiver until you are transferred to the individual who wrote this post. You’re building a new home. You don’t want to just plop it down anywhere on your property. You want to put it in the place that provides the best scenic view, looks the most appealing as you approach, and hopefully has the smallest environmental impact. Deciding on the orientation of the building requires taking all of these factors, and more, into consideration. The sun is a free source of heat and energy; the more you can do to harness its natural power, the greener your home will be. Allowing sunlight to enter the building and naturally warm up the space allows you to use less energy for heating during the colder months. 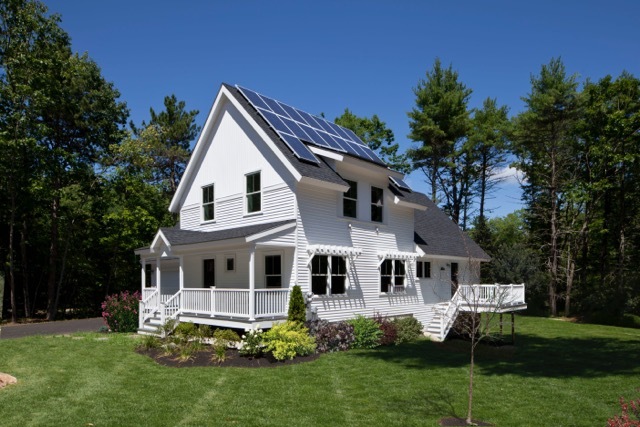 Research has shown that orienting a home to maximize solar gain can save 10-40% on heating costs. This not only means that you are spending less money and living more comfortably, it also means you are consuming less energy, reducing your environmental footprint, and benefiting from natural light throughout the day. That’s a pretty good return for a decision that typically costs zero dollars to implement. The best way to orient a house in New England is with one of the longer sides facing primarily south to allow the maximum amount of low winter sun to shine in. 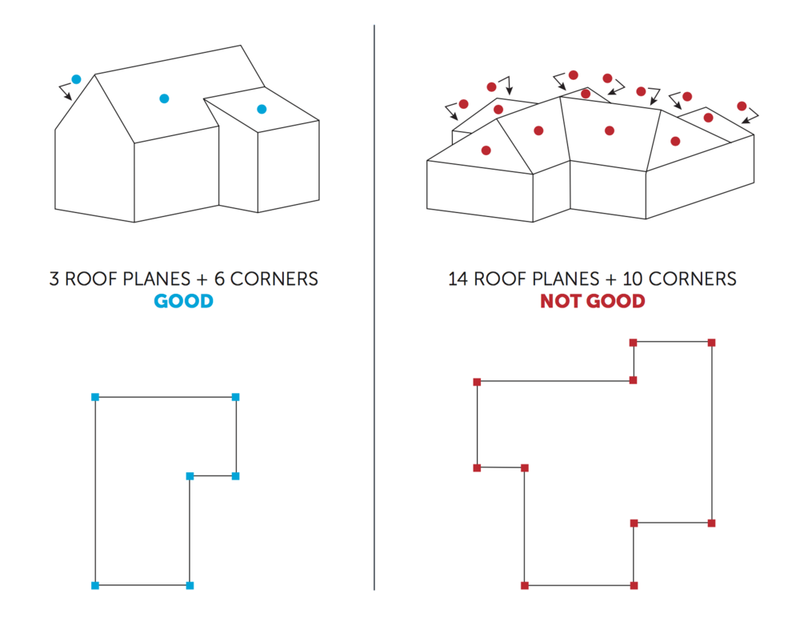 If you plan to install rooftop solar panels, either now or in the future, it is also important to make sure that one of the roof planes faces south. In a home that is basically rectangular, the combination of these two factors makes an orientation with the ridgeline going from east to west the most sensible solution. Good design and construction will help you improve efficiency by limiting the amount of heat that can transfer through the exterior, but a good green home also takes usage into consideration. Your home has a long life span. Start it off right with sustainable systems and materials that enable you to keep your environmental footprint small while still living comfortably in the modern world. Building elements are made up of all sorts of materials, and some are more eco-friendly than others. In addition to having a negative environmental impact, poor quality building materials can also affect your indoor air quality and the healthiness of your home. Eco-friendly options are almost always available and have become equal or nearly equal in cost, but if your builder doesn’t know that it is important to you, they might use whatever they have on hand or the cheapest option. Water consumption is an important part of living a sustainable lifestyle. Low-flow fixtures and toilets help reduce water use during daily activities like washing dishes and showering. Virtually all major manufacturers offer low-flow solutions so you can choose from a broad range of fixtures to match your style. The technology has improved over the years so most of the time you aren’t even aware that you are conserving water. Water reclamation systems that reclaim greywater from sinks, dishwashers, tubs, and showers are a great way to conserve water, especially in areas that are subject to drought. However, these systems tend not to be cost-effective in New England because water shortages are rarely a problem. Of course, water conservation is always a good practice, so if you want to invest in these systems it is always an option. Energy Star is the benchmark for energy efficient appliances in the United States and it is not difficult to find a broad range of options from almost every manufacturer. Although Energy Star appliances sometimes cost more to purchase, they will save you money on utility costs over the life of the equipment, and you can sometimes immediately save with local and national rebate programs. A notable exception is that Energy Star does not currently certify residential ovens, ranges, and microwaves. The humble light bulb has come a long way since its invention. Modern bulbs are designed to consume considerably less energy while producing the same amount of light and lasting substantially longer. Recent improvements in light quality and the ability to dim have made non-incandescent bulbs a viable option in virtually any setting. Energy efficient alternatives to traditional incandescent bulbs include compact fluorescent (CFL) and light-emitting diode (LED) light bulbs. They might come with a slightly higher price tag in the immediate future, but they can last for years and will help you save significantly on utility costs. After you have created a super tight home with air sealing, thick walls, and added insulation, it’s important to ventilate it properly. Natural ventilation, which is achieved by simply opening the windows, is best because it allows stale air to flow out and fresh air to regularly flow in without requiring any energy. However, if you live in New England you know that natural ventilation is not possible in the wintertime and can bring in unwanted humidity in the summer months. The solution is mechanical ventilation. Traditionally, home ventilation has been managed with familiar systems like exhaust fans in the kitchens and baths. Today, improved ventilation technology is also available, such as heat recovery ventilators (HRV) or energy recovery ventilators (ERV). Exhaust fans remove stale, moist air from the bathroom after showering and from the kitchen while cooking, but as you do this, air is pulled in from the outside through all the remaining holes in your house, wherever they may be. HRVs and ERVs bring in fresh air from the outside in a very controlled way and pass it through a heat exchanger that transfers heat from the conditioned indoor air that is being expelled. This allows you to get fresh air in your home from a safe source without using a lot of energy to bring it to the desired temperature. Heating and cooling mechanical systems are also important for any home. In a green home, you want these systems to consume as little energy as possible without sacrificing comfort. A tightly sealed home that is properly insulated requires much less heat input to keep it comfortable because all of the warm air stays in the home and does not escape through cracks and gaps. A lower heat load means that you can use smaller, more efficient systems (such as a triple-efficient electric heat pump) instead of an oversized fossil fuel burning furnace. Heat pumps work in the winter by transferring heat from the outside air to the air inside your home. In summer the process reverses and heat is transferred out of your home to the air outside. You get the benefits of heating and cooling with one system, which means you don’t have to purchase an air conditioner to feel comfortable on the occasional hot summer day in New England. Heat pumps also cost less to run than standard electric heating systems or furnaces. A lot has been written lately about the rise of intergenerational households. In this country it is commonly presented as a growing problem, as it is caused at least in part by reduced retirement security and adult children who wait longer to leave the nest than in the past. As much of the rest of the world has demonstrated, however, there are plenty of reasons why it makes good sense to combine households. If you are in a position to join households with your in-laws, you will likely find that everyone benefits from the arrangement. If you know it would be a good thing to cohabitate with the wiser generation, but want to hold on to the bliss of your own personal space, Accessory Dwelling Units are the way to go, and if you really want to do it right, make it a super-insulated airtight In-Law Flat. There are a number of reasons you’ll be glad you did. It’s not uncommon for grandparents to provide quite a bit of assistance when it comes to raising children, and studies have shown that being involved with children and grandchildren during their twilight years can go a long way towards improving their quality of life and preventing dementia. It’s great for children to have grandparents around to play with and learn from, and how wonderful would it be to have an extra pair of hands around when the proverbial diaper hits the fan? It’s a win-win-win situation for everyone involved, really. It will be much easier, in the event of a medical emergency, to help and care for parents if they already share your home. It could also be nice to have an extra set of hands for household projects, and there is a good chance that your in-laws possess expertise you do not that they’d be willing to pass down. This is America, after all. We love our wide open spaces. If there are a lot of reasons why it makes sense to bring the ‘rents on board, there are just as many reasons that you need your home to yourself. For example, everyone operates on a different morning schedule. What are you supposed to do when you wake up for your morning coffee only to be forcibly engaged in conversation about the weather? You can’t discuss anything until you’re at least one cup in, but explaining this will get you nowhere. While we’re at it, let’s not forget about the kitchen. The forever embattled kitchen. Whose turn is it to do the dishes? Not yours, you’re sure of it. Somehow, everyone will think that they ALWAYS do the dishes, and we are not here to argue. The fact is that however much you want someone else to do the dishes, you will be very annoyed by however they choose to go about it. Your parents spent years doing your dishes – let them off the hook, and give them their own kitchen. Your mother-in-law is always cold. What gives it away? She’s wearing three sweaters and a hat, huddled under a blanket in your living room pretending she’s fine but managing to evoke without words a terrible guilt in your heart for freezing the poor lady to death. The truth is that her house is cold too, because your Father-in-law is constantly turning down the thermostat. Imagine that they live just a few yards away in a compact dwelling that is so well tuned to the demands of winter that it always feels warm. She can take a few short steps to her own home, shed the layers, and sit down to her knitting or her crossword puzzle next to a bright and sunny window where no draft penetrates, with a wide sill large enough for her ancient Christmas cactus to live comfortably, you know, the one she inherited from her grandmother. You might, in time, find it difficult to lure her out into to the biting cold to make the journey to your corner of the property. Indeed, she may start inviting you over to her house – it’s warmer than yours, and she’ll bake you cookies. It’ll be like coming home from college. Nothing. He can turn it down as far as he wants, but he can’t force hot air to leave that house any faster. It’ll be days before she notices what he’s done, especially if the sun comes out to shine some free heat through the triple glazed windows. In the interim, there will be no arguments about the thermostat. You may have noticed over the years that you have found yourself repeating phrases to your father more and more often, a gradual increase that seemed innocent enough until you found yourself yelling at the top of your lungs, “YOUR APPOINTMENT IS ON THURSDAY. APP-OINT-MENT. THURRRSDAAAAAAY.” This is a small price to pay for the joy of human connection and familial bonds, but the sound of M.A.S.H. playing at a volume that vibrates framed photos of grandkids off the mantelpiece will get old, eventually. On the flip side, let’s not pretend that after all they have accomplished in their lives, your in-laws are eager to settle down to a relaxing retirement of shrieking toddlers, punk rock music, and the constant growl of a blender churning out organic green smoothies. Fortunately, the quaint cottage they inhabit is way better than cramming themselves into the spare corners of your home. As previously discussed, they will be more comfortable, have more freedom to decorate according to their own stylistic whims, and they won’t be picking up after you, which will do wonders for the ol’ hip. Best of all, the thick and densely insulated walls of the accessory unit will do a great job of ensuring that the only racket anyone has to listen to is their own. Setting up an accessory dwelling unit for your in-laws is a great fiscal choice in terms of household management, but as with all things, you will need to convince your father-in-law of this, and as it is sometimes difficult to place a monetary value on creature comforts like warmth, fresh air, and sanity, it may be that your argument doesn’t quite conform to his spreadsheet of expenditures and compounding interest. That’s okay, because next to his sleek white Tesla Powerwall is a power monitoring readout. If you can’t assign a dollar value to the psychological benefit of ample daylight, you certainly can price out a Kilowatt. Even better, he can watch those dollars as they are sucked from thin air into the battery, and then log in online and see a bar graph of how the home is performing. He can view the information by day, month or year. He can probably export a spreadsheet and bring it to dinner on Sunday night, and explain to you how it all works. As you can see, there’s no downside. BrightBuilt Home’s In-Law-Flat is efficiently designed and obsessively detailed for maximum performance. Give us a call, and let’s make this happen! Foundation to Finish — in Just a Few Minutes! Ever wonder how exactly our homes get built? Been curious to understand the crane-lift-set process? With the help of this home's technically savvy homeowner, we bring you a time-lapse perspective of the on-site assembly of our off-site built modules. You'll have a chance to watch the entire home come together - from the pre-poured foundation, to the final roof shingles, and the final product after siding was installed and decks were built. Every time we see one of these sets, we are in awe of the condensed time and the impressive skill of the crane drivers and assembly team! Ever since we came out with the In-Law Flat and Guesthouse, a number of our respective Mother-In-Laws have been dropping hints that they’d love to set one up in our (respective) backyards. It’s a compelling idea for a lot of reasons, and some of us do have some space on our lots for potential expansion, but questions abound. Do the lots suffice for an accessory structure? Does the town permit ADUs, and under what conditions? Are cookies and free childcare implied in the arrangement? If you’ve ever investigated your city or town’s rules about what you may or may not build, how you should build it, and whether you need a permit, you know that government websites can sometimes be difficult to navigate, and that code language is, at best, opaque. This is further complicated by the fact that every town organizes their website and the information found therein somewhat… shall we say… uniquely? Yes, let’s say that. Fortunately, we’ve spent many a day with our noses buried in some town’s zoning ordinance, have developed something of a workflow to find what we need quickly, and are happy to do our part to demystify the process for you. Here, we walk you through navigating your town’s website to find answers, and present 5 case study examples to further paint the picture. If you live in Yarmouth, ME, Brunswick, ME, Worcester, MA, Portsmouth, NH, or New Haven, CT, it’s your lucky day! We’ve helped you get a head start. This is, arguably the easiest step. If you are an avid googler, this next statement will come across as elementary, but for the folks who are still trying to figure out how the cats get through the Internet tubes, here is our foolproof search term algorithm. Google [town or city] of [name of town], [state], website. For example, “City of Portland, ME, website.” The first result will almost always be the one you want. Step Two: Find the Planning and Development Department section of the website. Typically there will be a link or drop-down menu called “Departments.” You will be looking for a department called Planning and Development, Code Enforcement, or Building and Zoning. There is no standardized term that every town will use, but the department you want has some combination of these words. Once you have found the appropriate department, you will be looking for these key words: CEO or Code Enforcement Officer, Zoning Map, Codes, Ordinances, Design Standards, Charter. You may need to click on a few of these to find what you need, but you are trying to find contact information for the Code Enforcement Officer, a map that indicates what building or planning zone in which your home is located, and the comprehensive development plan that will describe what types of buildings are permitted in each zone, as well as the rules that govern how they are built. If you want, you can stop here. You have the CEO’s contact information, and you can write or call them with your questions. Some will be more open than others, and some will simply link you directly to the files you need. Our preference is to come into that conversation with at least the illusion that we have made an attempt to find the answers we are seeking, and we find that this also helps start things off on the right foot. If you’re of a similar disposition, read on! Step Four: Find your property on the zoning map. This can be very easy or very hard, depending on your town’s participation in 21st century. You may find that your zoning map is a PDF file, or a number of PDF files, with bright blocks of color and no street names. If this is the case, Google Maps is your friend, and rivers, railway tracks, and major transportation routes will provide the patterns you need to locate your plot. Alternatively, you may find that your town has provided you with an interactive online map that you can search by address and select the layers of information you want to see. If this is you, do a fist pump, whisper “yesssssss” and select “zones” for the map overlay. Take note of your zone and its abbreviation. Locating the correct zoning ordinance file is arguably the most difficult, but you can do it. It will be called “Zoning” or “Ordinance” or “Charter,” and unless you live in a very small town, it will be at least a hundred pages long (Portland’s is 944 pages long). If you’ve opened a file and you’re not sure if it’s the right one, check out the table of contents. There should be references to different zones or districts both residential and commercial, wetland or open space preservation, building permits, and definitions. At the top should be the date the ordinance was adopted or amended– make sure it’s within the last few years. If you value your sanity, don’t try to read it. Step Six: Find the Definitions. Usually they’re at the beginning, but sometimes at the end, and they are arguably the easiest part of the document to comprehend. In this case, your goal is to find out whether your town has made provisions for accessory dwelling units in the code, and if so, what term the town is using to discuss them. Alternative terms are “accessory apartment” or “efficiency unit”, and it’s very possible that your town has found some other word to describe it. Your task is to learn what terminology will help you find the rules that govern building an ADU. If you are using a Mac, hit Command + F. On a Windows machine, Ctrl + F. A little search window will pop up at the top of your screen. Type in the term your town uses for Accessory Dwelling Units. That little window is your gateway. As you click the little down arrow, it will bring you to each mention of your search term, highlighted, so you can read what it has to say about your term. You will find that unrelated instances of the word pop up, or that there are several sections that seem to contradict each other regarding your search term. Simply scroll far enough through to get some context – you will probably find that it describes your term for each zoning district. Ignore the ones that aren’t your zone. They have nothing to say to you and their opinions don’t matter. Takes notes on your understanding of the rules as they pertain to ADU’s in your zone, then move on to the next step. Go back to the department landing page and find the CEO’s contact information. Write a polite email describing what zone you’re in, what you want to build, and your understanding of what you have found in the building code. Ask them to confirm your interpretation, and guide you to any documents, amendments, or specific portions of the code that might provide further clarity. To help give you some context for how your own research might go, we used this method to research ADU requirements in 5 communities. What we found is listed below. 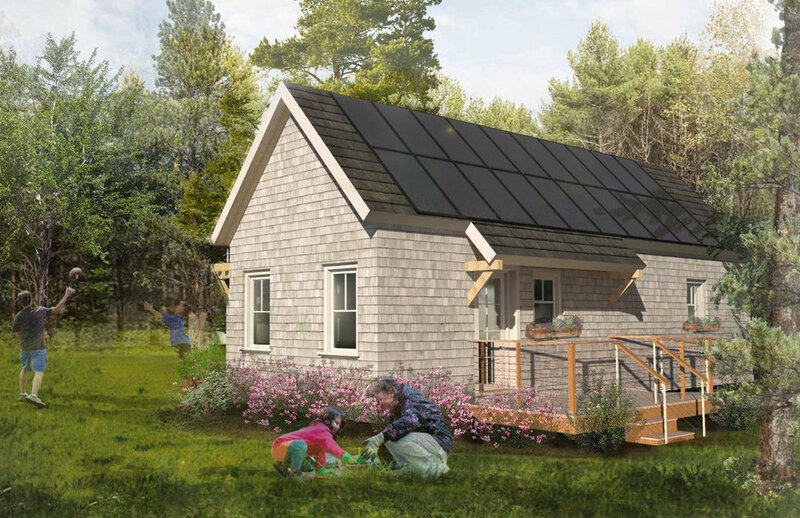 · “Accessory Dwelling Units” (ADUs) are allowed in Village Center, Village Residential, and Farm and Forest districts, but not in Resource Protection or Shoreland Zoning. They must comply with all of the existing lot size and setback requirements as defined for each of those respective zones. · An ADU may be no more than 1 bedroom and 40% of the living area of the primary dwelling on the property. There may only be one ADU. · The owner of the property must live on the property, either in the primary dwelling or in the ADU. · May be no larger than 750 square feet or 35% of the primary dwelling’s living area, whichever is largest. The limit is one per lot. · Accessory Dwelling Units are not defined in the code in any way, and there is no section that deals specifically with building a stand-alone second dwelling on a property. · We emailed the CEO, who directed us to a section about Residential Conversions, which allows a maximum of two dwellings per lot, requires the usual setback and yard requirements be respected, and forbids alteration of the external appearance of the primary dwelling. This seems to translate to building an independent living space into an existing home, such as a basement suite, though it is not well described. · A second section concerning “Cluster Groups of Single Family Dwellings” appears to be geared toward small development, and may or may not apply to ADU’s. · Attached and detached accessory dwelling units (AADU and DADU, respectively), require a conditional use permit, and have a max of one per lot. · The owner must live on the property, and may operate a business out of the dwelling they occupy – You can’t build an ADU for the purposes of running a business. · If attached, it must appear to be part of the primary dwelling, and if it has a separate entry, it must be clearly secondary. · If detached, it must be separated by at least 20 feet from the primary dwelling. · If detached and the lot is more than 2 acres, the ADU may be up to 1000 square feet. · All setback and yard requirements for the lot must be met. · There must be one parking space per dwelling unit. · There are provisions for “Elderly Units” but it is unclear from the code whether this is intended for larger communities of elderly housing or owners of single family dwellings wishing to house a loved one. Overall, there are a couple of themes that run throughout our research. For the most part, it is important that the ADU is only constructed on a lot where the owner resides, and that the ADU is not of overwhelming size or contrary to the appearance of the primary home. Generally speaking, when planning an ADU it is a good idea to make sure that it complies with the existing requirements for setbacks in the appropriate zoning district. You can learn about the setbacks on your property using the search strategy I outlined above, paying special attention to the particular zone in which your property is located. If you decide to take a crack at learning about your town, we would love to hear how you made out. Was the information above helpful? Did you get in touch with your CEO? Did you learn anything surprising about your town? For example, we happened across a rule in Worcester stipulating that the only birds you are allowed to keep on your property (excepting household pets) are Carrier Pigeons. If you let us know what you find, we’ll share the most intriguing, most useful, and most confounding! This blog post has been brought to you by Kai Fast, one of BrightBuilt’s crackerjack project coordinators, and blog-writer extraordinaire. The following blog post first appeared in The Richter Group at Keller Williams' February Newsletter. Our heartfelt thanks to them for letting us share it with you! Shop around. Comparison shop to get the best rate. Ask about the margin. If you're offered a rate that's lower than the competition, it's probably just an introductory rate, so ask about the lender's margin. For example, if the introductory rate is 3.5 percent and your lender's margin is 2 percent, your final interest rate will be 5.5 percent. Consider a conversion clause. Some HELOCs allow you to convert a variable interest rate to a fixed rate, usually during the draw period (5-10 years). Watch out for balloon payments. Balloon payments mean that you must pay the balance in full when the draw period is up. Do not choose this option unless you have the financial means to handle it. Create a family plan. Decide what the money will be used for and who will handle the funds. Keep in mind, you can lose your home if the HELOC is not handled properly. Create a payback plan. Come up with a reasonable plan for how the loan will be paid back. Have you been watching the latest developments on accessory dwelling units? You might be interested in an exciting new offering that we’re rolling out here at BrightBuilt Home. We are officially announcing our new In-Law Flat and Guesthouse, as a featured addition to our current zero energy homes portfolio. With this home, we aim to meet new demands for accessory housing, and help current homeowners expand their options for housing family members, creating rental income, and creating opportunities for aging in place. As you may know, this has become a popular topic nationwide. The National Building Museum in Washington, DC, for example, is currently featuring an exhibit around the shifting demographics of America - and the corresponding housing needs that are evolving around these shifts. Other stories around accessory housing have also been emerging of late, including City Lab’s look into trends that address a dearth in rental options, the City of Boston’s newly launched pilot program around Accessory Dwelling Units (ADUs), Curbed’s look at the urban housing crisis, and NPR’s coverage of how ADU’s are helping keep Portland, Oregon’s housing affordable. Given this level of attention toward finding solutions for multi-generational living, short term rentals, and long term rental demands, we believe your audience may be very interested in this announcement. The attached Press Release (click here to download PDF) tells the story of this exciting new addition to our work (body of the press release also copied below). Please do not hesitate to follow up with any questions or for further clarification. Thank you. Open house in Cumberland, Maine! 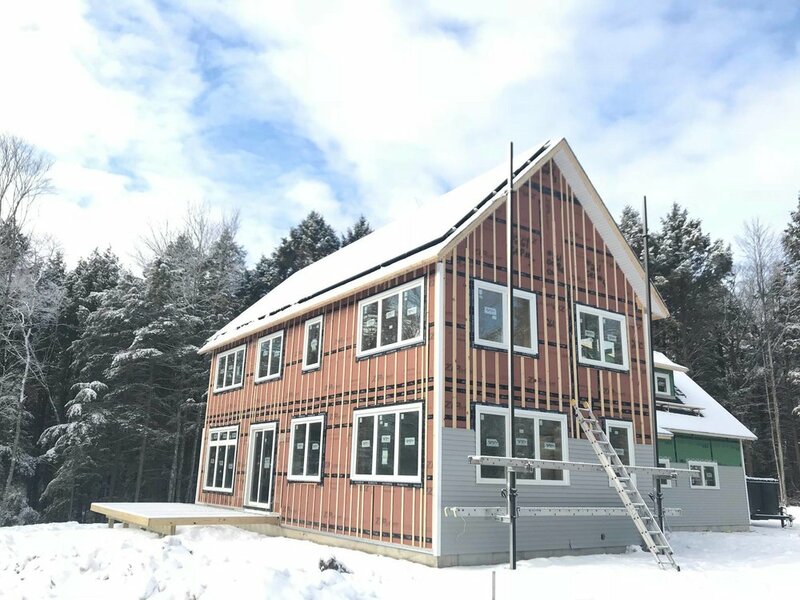 If you missed the chance to see this BrightBuilt Home under construction in December, or if you want a chance to see it again now that it's done, please mark your calendar! This home is a custom variation on our Cushing design, and is perfectly suited to the active family who will soon be calling it home. This particular Cushing comprises of 4 bedrooms, 3 baths, an open concept living-dining-kitchen area bathed in sunlight all day long, a walk-in pantry, and a generous mudroom for a total of 2300 square feet of finished living area, plus a full basement, a spacious heated workshop, and generous 2 car garage! You may have cash in hand, or you may be going to your local lender, but in either case, it's wise to know some options for how one can come to own his or her own BrightBuilt Home In-Law Flat and Guesthouse. We’ve been talking to local banks, and have honed in on 3 of the most straightforward ways to add this tidy little living space to your property. Given that interest rates are on the rise, your best option might be to apply for a stand-alone second mortgage – or Home Equity Loan. This is a good choice when you have built up equity in your property. A Home Equity Loan is a mortgage for a smaller loan amount that is separate from your existing mortgage. The term over which it can be paid back will vary according to lenders, who will typically ask for 30% down. A second mortgage is a great option when your current mortgage has a low fixed interest rate that is better than the interest rates currently available in the marketplace (and you therefore do not want to refinance that current mortgage and lose that great rate!). If you are interested in this path, it will be important to bear a few things in mind. First, your new in-law flat will need to be appraised, as the finished value of the improved property will have bearing on how much you can borrow. BrightBuilt Home can help here by providing documentation as to the added value of our high performance construction, but plan to allow time for the appraisal to be completed. Also, banks can’t sell second mortgages in the open marketplace and as a result larger, national banks may be less apt to write second mortgages. If you approach smaller, local banks that have a residential lending department, you will likely have an easier time. Finally, if you do not yet have substantial equity built up in your current home, and you will be renting the In-Law Flat to a friend or family member who you can depend on for rental income, you may be able to bring them in as a co-borrower in order to enhance your lender-qualifying profile. Another possibility you can explore is a Cash-Out Refinance on your first mortgage. The bank refinances the mortgage you already have with them, which frees up a lump sum of cash that amounts to the difference between what you owe on the original mortgage and the full value of your home. For example, if your lender will allow a cash out refinance of up to 80% of your home’s value, and your home is valued at $400k, you will be able to refinance the mortgage for $320k. If you still owe $200k on the mortgage, there will be $120k available in cash with which you can improve your property. This is a viable option for many homeowners, and in many cases can be easier to get because you are drawing on the value of what you already own. If you opt to go this route, be mindful of the current interest rates. If rates are higher that what you’re currently paying on your mortgage, you may find that refinancing your property will render a higher overall monthly payment than you would have had if you’d kept your original mortgage and taken out a second mortgage for the in-law flat alone (see above). Whether this is the case will depend on the terms of your particular mortgage, but this is worth keeping in mind. The third option is also the simplest. Cash will not require appraisals, credit checks, or lending paperwork. You may be able to pull cash from retirement or investment accounts, and unless you are withdrawing from an IRA or 401k, there are no additional costs to using this money for your project. No matter your situation, we recommend talking to at least a couple lenders about the project you’re planning. Different banks will offer different arrangements and interest rates, and it’s worth shopping around to see what’s available. If you are wondering whether an In-Law Flat is a feasible option for your property or you want to know more about the process of purchasing one, please don’t hesitate to give us a call! Like many people this year, I traveled for the holidays, arriving home to a chilly house in the center of an arctic vortex. With more time than usual to fuss over the eccentricities of a house that is, frankly, too young to have so many eccentricities, I found myself reflecting on what a housing upgrade might mean for my life. More specifically, what aspects of my holiday I would be happy to do away with, next year. There is nothing quite like staggering out of bed into a cold kitchen, intent on that first glorious cup of hot coffee, and then staring dumbfounded at a kitchen tap that simply refuses to fill your kettle. Turn it on, turn it off. Hot, cold, doesn’t matter. Nothing comes out. Cue the panic. If you are smart, you have a stockpile of water jugs hiding in the back of a closet, because you live in a part of the world where electricity occasionally disappears, shallow-dug wells run dry, or pipes freeze. If electricity is not your problem, you can heat some of that emergency water in a kettle and take care of the coffee issue, whereupon you can focus on the puzzle at hand, restoring water to your house. In my case, a ceramic heater, patience, and strategic running of specific taps in a precise sequence achieved the desired effect, however it should be noted that, somehow, the pipes feeding my two best friends -- Clotheswasher and Dishwasher -- will not release their grip until the temperature outside approaches 20°F, no matter how many heaters I relocate. These appliances are fed by pipes that travel through the least insulated and least accessible regions of my home, the exterior walls. I can be heard grumbling to myself, “this would never happen with 10 inches of densely packed cellulose insulation,” as I fuss with yet another heater, placing it under the sink, and then sobbing because I’ve spotted a leak in the drain pipe. I know that it is a fashionable and desirable design strategy to “bring the outside in” or “blend the living spaces with the landscape” but listen: there is a time and a place for everything and THIS IS NOT THE TIME OR THE PLACE! Living in the Northeast, intentionally, means that you accept certain realities, such as -20°F cold snaps that make anything other than hibernating seem like pure folly. Originally from the Canadian tundra, I know this better than most. Still, I object to the breeze wafting across my neck. It’s not unlike the brisk wind one might experience while watching Teenagers from Outer Space at the drive-in late in the season, wrapped in a sleeping bag in the back of a pickup truck, except I am sitting on my couch, indoors, with all windows and doors closed. BrightBuilt Home knows that in this climate, the outdoors should only come inside when invited, and that they are not invited in January. Depending on the age of your ventless propane heater, assuming you have one, (you know, for emergencies like this) you will want to pay close attention to every symptom you exhibit while that gloriously warm deathtrap is running. Working as I do in the field of high-performance building (and living as I do in a prototype of the polar opposite) I am perhaps a little paranoid. That said, when my brain starts to refer to propane as “the smell of warm,” my throat begins to close up, and a foggy headache knocks me down every time I try to stand up, it is time to turn off the “backup” heat and get some fresh air in the house. Of course, the fresh air is the temperature of nope, and it’s not long before I go back to my friend, who I know is not good for me, and beg it to make me warm again. I am apparently the only member of my household who suffers these symptoms, and so have the dubious distinction of being the proverbial canary in the inadequately ventilated farmhouse. When I pass out from the fumes, I dream of a continuously-running, heat-exchanging, dust-filtering angel named Zehnder. You know cats. Deceptively fuzzy, innocent looking, heat-seeking little monsters with raptor talons and bad attitudes. I have two of them, and for the most part they are remarkably independent, happy to race around the house destroying everything in sight without much input from me, and only rarely slow down to accept 1.75 gentle strokes of the head (not the back) before biting me and dashing away. I have noticed, as the season progressed, that a cooler house meant more cat affection. It so happens that, prior to Christmas, there were several mornings that found me sitting on the couch with a cat on my lap, scratching her under the chin or behind the ears. It was nice, the sort of thing that I always imagined other cat owners might experience. Now that the temperature has plummeted, the cats have figured out that the warmest things in the house are the humans, and it really has turned into too much of a good thing. No sooner do I sit down than I have a cat on me, demanding my active affection, kneading my bladder like a blob of bread dough, sinking her claws into me if I contemplate moving, daring me to get up and go to the bathroom. At night I lie awake with a cat nestled between my knees, afraid to roll over. If I do, she will attack my feet, her claws somehow penetrating the thick comforter as I stifle cries of pain. If it was up to these little hellions, I would never go to work again, or rather, I would be otherwise employed, providing body heat for their enjoyment. BrightBuilt Homes don’t come with cats. Lying on my back on the uneven dirt floor of a crawl space, I am trying to decipher the maze of water pipes with a flashlight while a disturbingly large spider beckons to me with one slow, creepy leg. I spend a lot of time down here, thanks to the shoddy workmanship of any number of individuals who should turn in their tools, immediately. I have perfected my army crawl, tools in a bag wrapped around one fist, ducking under plumbing traps and scrambling over unused ducts, bruising my knees, and avoiding cobwebs. It really should be called a slither space, as there are only a couple of spots where one can properly crawl. As I contemplate the water pipe fiasco above me, I reflect on the number of hours I have spent laying in this space, puzzling out a solution to some incomprehensible situation, or the evidence of some profound idiocy. I would estimate that every fix I have attempted that involves a visit to this slither space takes about 3 times longer than it should, involves several days worth of procrastination and dread, and results in a less than ideal solution because the only true fix is to tear the whole thing down and rebuild it. What would I give for the peace of mind of knowing that my home had been planned and put together by vetted professionals with a sound understanding of heat loss, water management, and junction boxes that don’t spark when someone upstairs flips a switch? A lot. I would give a lot. Days like these remind me of why I do what I do. My house is not so unusual in terms of building standards, and three seasons of the year it feels perfectly adequate. It is not so old, built in ’79, and satisfied code at the time. When the temperatures dip far enough, I am reminded on a visceral level that there is a better way to do things, and that it’s worth it to keep pushing for higher standards in building. Tucked into a wooded site, this variation on our popular Appledore design features a southerly orientation, a first-floor master suite, and a wide open floor plan perfect for entertaining. The floor plan is compact and efficient, tucking three bedrooms and two and a half baths into 1750 square feet of cozy, light-filled rooms. This particular home was stick built on-site by Senecal Construction and has been performing excellently amidst this unusually long cold snap. OUR NEW INLAW FLAT & GUESTHOUSE! If you've been wishing for some added living space, we're cooking up the perfect solution for you! Can be moved to another site at a later date! Stay tuned for more details on this exciting new option - coming to a backyard, lakefront, or woodland setting near you in 2018... Please contact us today to learn more. Located on a generous wooded lot, this Cumberland home has been built to our demanding performance criteria and designed with a rural lifestyle in mind. Tall windows connect an open floor plan to the outdoors and provide commanding views to a flowing stream. A large entry allows for a sizable mudroom that can be hidden away behind a sliding door. The attached garage provides space on the 2nd floor to grow into, and a large workshop offers ample space and storage for tools and projects. While the weather permits, a deck, screened porch, and outdoor shower will allow the occupants to make the most of the Maine summers. See this house as it is taking shape while under construction - and imagine what your next Holiday gathering could be like in a BrightBuilt Home! Open House in Ithaca, New York! Featuring cutting-edge design and energy-efficient construction, the Great Diamond is capable of producing as much energy as it will consume in one year, achieving Net Zero Energy status. Reminiscent of Maine’s iconic barns, the Great Diamond blends comfortable spaces with an efficient form. For this Great Diamond, a compact footprint houses a cozy and smart-sized first floor living area, with a wheelchair-accessible entry & 1/2 bath, and generous kitchen. The second floor is home to a master suite with walk-in closet and ensuite bath, and 2 bedrooms, a full bath, and laundry area. The third floor loft has been dedicated as a generous bonus space that capitalizes on great views. 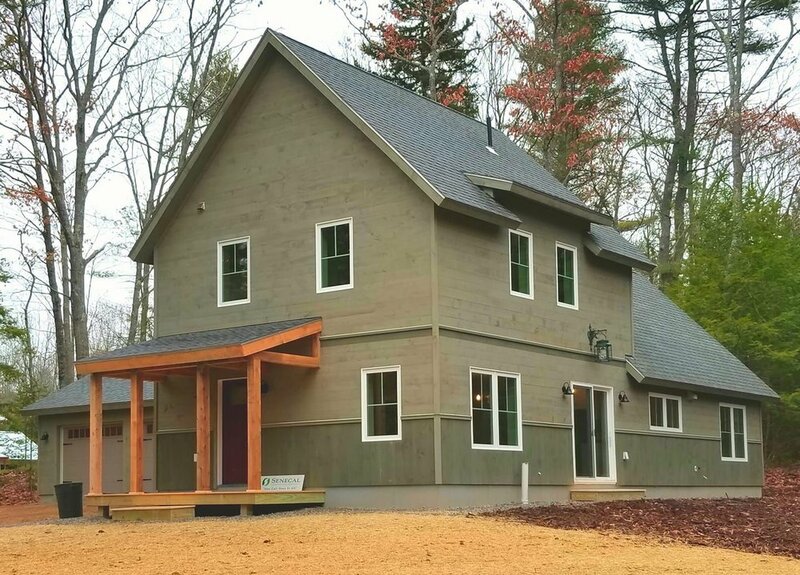 Come on over to check out our first BrightBuilt Home to be built in New York! Many people depend on having predictable monthly expenses as part of a household budget. The more you can decrease those expenses, the more money you’ll have to save, invest, and enjoy. Many people also make the assumption that a green home costs more, but the truth is, building a new green home can actually help you reduce your monthly expenses. If you were buying a new car, you wouldn’t search for the one that has the worst gas mileage. In fact, you might even look for one that consumes no gas at all, especially as other alternatives become more readily available. However, when building a new home, most people assume that they have to install a furnace when the fact is, there is a reliable and more affordable alternative: electric heat pumps. Having a furnace is like having a dinosaur in the basement. It’s old technology that consumes both fossil fuels and your monthly budget. Furnaces also produce exhaust that can affect the air quality in your home. Electric heat pumps have the added bonus of providing energy-efficient cooling during the hotter months, so you’re basically getting a built-in air conditioning system. This is especially useful for New England homeowners who want to be comfortable during those few extra hot weeks, but don’t necessarily want to invest in an air conditioner. Don’t forget about your electronics and office equipment next time you decide to upgrade. The less power all of your devices consume, the lower your bills will be. Although they might not be monthly expenses, home maintenance costs can add up over the course of a year. A green home is built to be durable and low-maintenance, so you can cut costs associated with furnace repair, duct cleaning, moisture damage, and more. If you decide to install solar panels on your green home, your monthly expenses shrink even more because your house produces most or all of the energy it uses. Imagine having an electricity bill less than $10. You can do it with a green home! To learn more about how a green home can help you save money every month, contact BrightBuilt Home today.